The holiday farm Steinach, which consists of 16 holiday flats, is located in a quiet area just outside Algund. The apartment Dodici is located on the 2nd floor and has a living room with a sofa bed, 2 bedrooms, a well-equipped kitchenette and a bathroom. It can therefore accommodate 6 people. Wi-Fi and cable TV are also included. The residence is beautifully situated in the middle of the Italian mountains and offers a fantastic view of the untouched nature of South Tyrol. Outside there is a private balcony where you can enjoy a glass of wine and delicious meals in the fresh air and on the ground floor there is a spacious, shared terrace. 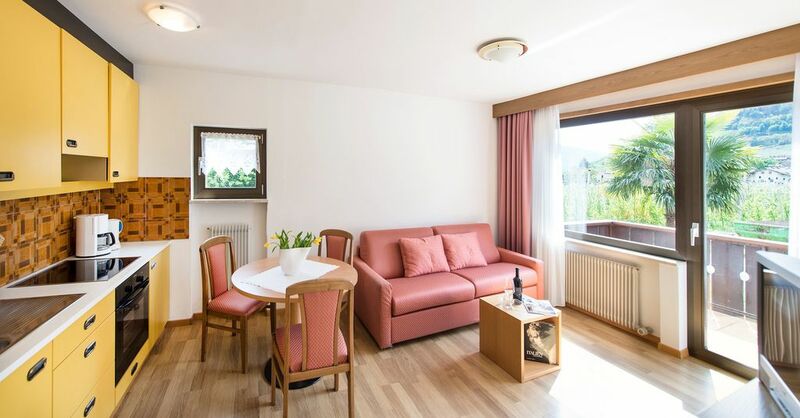 Due to the central location, a supermarket and a small selection of restaurants are 250 m away while the centre of Merano is 4 km or 7 minutes by car from the property. A 17-minute drive will take you to the Merano 2000 ski resort, where you can enjoy the white fresh snow of South Tyrol during the winter months. Parking spaces are available on the property. A garage for your car is available upon request and at an extra charge. Pets are allowed (upon request, for a fee). Bed linens and towels are included in the price. A cot is available upon request. Guests are permitted to use the pool of another property 5 minutes walking from the Steinach residence. The washing machine can be used for a fee.